Very pretty Morton flowerpot with attached drip saucer! Attractively styled in a basketweave pattern, flower pot measures 4 3/4" tall, 5 1/8" diameter, and bottom is marked Morton, USA. 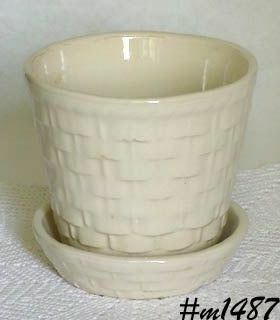 Flowerpot is in a pretty soft white color with shiny glaze and is in wonderful condition with no evidence of use. This listing has an absolutely beautiful, absolutely mint condition planter! It's shaped like a Scottie dog and he's lying down scratching his chin. 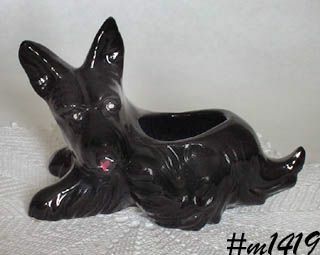 Planter is black with shiny over-glaze and was early from the mold -- crisp clear details -- and is a nice size too! Little doggie measures 6" tall (at tallest), 8" long (at longest), and 3 3/4" wide (at widest). He's gorgeous! 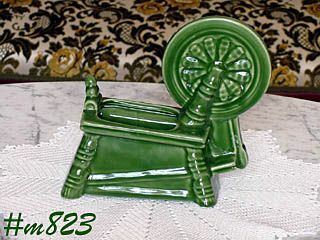 This listing has a very nice planter shaped like a spinning wheel! 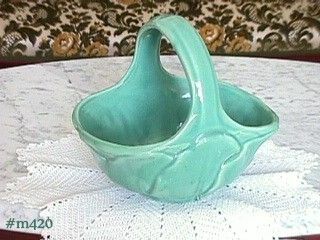 Produced by Morton Pottery, planter is a very pretty dark green color with shiny over-glaze. It measures 7 1/2" tall (at tallest), 7 1/2" Long (at longest), and 3 1/2" wide (widest). I have no idea which California pottery made this cute planter but it's heavy for its size and it is definitely vintage! 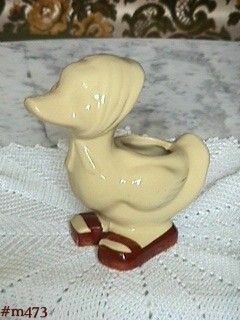 Planter is shaped like a duck and she's wearing a "scarf" that's "knotted/tied" under her chin. She's also wearing what appear to be sandals -- have brown bottoms and brown straps across her feet. This is a lovely unmarked planter of a nattily "attired" blonde boy standing by a stone gate or fence! This listing has an unusual tiger planter! It's rather large and heavy -- measures 10 3/4" long, 9" tall (from bottom to tallest part), and is a very pretty brown color with shiny over-glaze. 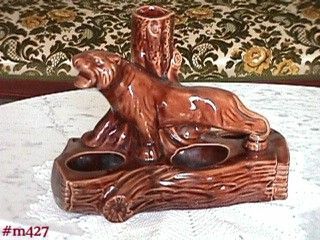 The tiger is "standing" on a log base (the planter part) and is in front of a tree trunk -- lots of detail! The base has 3 openings for plants and the tree trunk has a top opening -- artificial flowers/greenery would look especially nice! Planter is in excellent condition. This is a cute little planter shaped like a Dutch shoe! 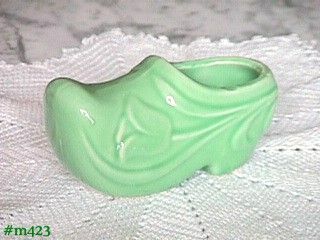 It's a lovely light green color and has an in-mold tulip on each side. 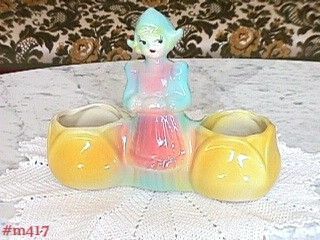 Planter measures 5" long and is in wonderful condition -- no dings, no chips, no cracks! This listing has another beautiful pottery piece that does not have a manufacturer's name -- it is simply marked Made in USA inside what appears to be a shield (I think it's shaped like a large, somewhat flattened acorn). The basket design appears to be overlapping,upraised leaves that are all around the basket portion. Although unmarked, this is such a pretty planter! 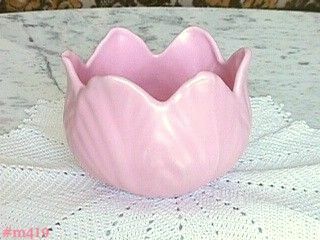 It's shaped like a flower bloom (looks like a tulip to me) and is in a lovely soft pink color. It measures 4 1/2" tall and 5 3/4" diameter and is in wonderful condition -- has no chips or cracks, does have normal age/use crazing. Per reference books, this planter was made by American Bisque and is called Dutch Girl with Tulips! Planter consists of 2 round shaped 3" pots that look like yellow tulip blooms. 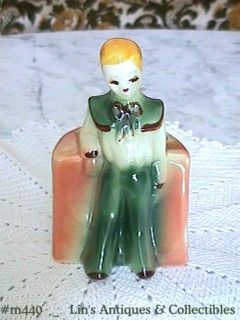 Joining the pots together is a little Dutch girl that is 7 1/2" tall. She is "wearing" a blue bonnet and blue dress with a pink apron. She has blonde hair and and beautifully detailed face.